All of this changed yesterday when I was going through my Arduino notes and came across some attempts by others to use the Arduino IDE to program the ATtiny. One fellow was successful on the ATtiny45. 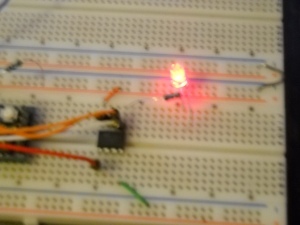 Another tried on the ATtiny85 but didn’t seem to get as far. After much searching, I stumbled across the Arduino-Tiny project. The project is fairly mature, and they have already done all the hard work. The result is fantastic. You can program in C++ using the regular Arduino libraries (which have been modified for the ATtiny). Of course, many features are not available, but that is expected. When you have your sketch written, you can upload it to the ATTiny using either an in-system programmer (like USBTinyISP) or even better, you can use an Arduino itself. I was close, but no cigar. After considerable searching again, I at last found the solution to the problem. It appears you must tie the reset pin of the Arduino to high (+5v) via a small resistor (120 ohms is recommended, but it also worked with 500 ohms in my case). At last, sweet success – a blinking LED. My thanks to the folks on this Arduino thread for that insight. 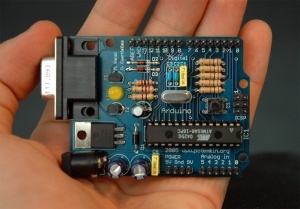 Make sure you are using the latest Arduino IDE – currently version 022. Close it if you have it open. Go to http://code.google.com/p/arduino-tiny/downloads/list, and download arduino-tiny-0022-0008.zip or the latest version thereof. In your sketches folder, create a folder called “hardware” and put the contents of the zip file in it. If you haven’t figured it out, the ‘#’ sign at the beginning of a line will comment it out. Make sure only one of these lines is not commented – the one you want to use. Open the Arduino IDE. You should now see each of the boards listed in the file you just edited. You should now see the LED at pin 9 slowly pulse on and off. VERY IMPORTANT: To finish turning your Arduino into an ISP, you must connect a 120 ohm (500 ohm seems to work as well for me anyway) resistor from the reset pin to +5v. What this does is prevents the Arduino IDE from resetting the Arduino itself. After all, we are not programming the Arduino anymore after this, but the ATtiny. Don’t forget to remove this resistor when you want to program your Arduino again. Open up the Blink sketch, under examples/basics. Change all instances of pin 13 to pin 0. Under the Tools/Board menu, select the ATtiny version you are using. I am using an ATtiny85, clock speed 1MHz. No external clock is needed. Hook up a 1k resistor & LED from ATtiny pin 5 (digital 0) to ground. Upload the sketch. Your Arduino pin 7 pin should blink, and the error pin should stay off. When it is done, your ATtiny LED should be blinking on and off. Verify each step and the results. Hook up the LEDs to your Arduino to make sure it is working as an ISP. Make sure you have selected the right board for each chip you are programming. You are now (hopefully) able to program an ATtiny with the same ease as you can an Arduino. The ATtiny chip is cheaper and smaller than the ATmega, and is perfect for light duty applications. The default fuse settings for ATtiny85 appear to be 1MHz for the clock. If you want a faster clock, you will need to change those. That will be my next project. If you have trouble or questions, post me a comment below. I’ll do what I can to help. Enjoy those ATtinys. Program an ATtiny Using an Arduino by Provide Your Own is licensed under a Creative Commons Attribution-ShareAlike 4.0 International License. This entry was posted in Tech and tagged arduino, attiny, electronics. Section: Article. Bookmark the permalink. Both comments and trackbacks are currently closed. You might have a typo in step 6. I think it is “ArduinoISP”, not “ArduinoIDE”. You are absolutely correct. I have made the correction. Thanks for the tip. You might have a typo in step 6. I think it is “ArduinoISP”, not “ArudinoISP”. (-, just kidding, great tutorial! Chipkit would be better option. ChipKITs can be programmed using the original Arduino™ IDE modified to support PIC32. These comments on programming PICs in an Arduino-like fashion are great. In looking at the two solutions mentioned, the Pinguino is promising. I like it being open source. The downside is it uses a different IDE and currently does not support C++; only C. The support of C++ is the Arduino’s biggest advantage to me. The Chipkit also looks great – it uses the ArduinoIDE. The downside is it is a proprietary board for only one PIC chip. What would be great to see is the combination of these two. The ideal would use the ArduinoIDE as does the Chipkit, but support entire families of PIC chips, such as the PIC18F series with built-in USB support. It looks doable – the Chipkit people have done it for one of the chips. Comments? Ideas? Thank you for your article. I was trying to program another chip using arduino UNO for 4-5 weeks. I’ve read lots of articles but somehow I couldn’t upload. At last, I managed to program attiny2313 at 1mhz with your code. And there is no resistance between 5v and reset pin! Thank u.
I am new ao this audriuno. recently I got the Audriuno board. Now I have a new Atmega168 . How can I program it in Audriuno? Is there any special needed when programming a IC first time? The pin diagram is incomplete. AREF (pin 0) should be indicated. Pin 4 also supports PWM. It would be helpful to mark SCK, MISO, and MOSI. I’ve been working on some better pinouts for the ATtinys. If I get them done, I’ll try to post them. In the library code I have from the ATtiny project for Arduino, digital pin 4 does not support PWM, even though the underlying hardware does. Is my code out of date? can I use smd attiny’s too? > The default fuse settings for ATtiny85 appear to be 1MHz for the clock. If you want a faster clock, you will need to change those. You can change the fuse settings by selecting the appropriate board then executing Tools / Burn Bootloader. Thanks for the tip. I’ll have to give it a try soon. Hey — another big thanks for putting this together… it works! Worth noting: I got the “please define PAGEL and BS2 signals” error, but it appears from a bit of googling that it’s more of a warning. The code works fine, no one seems to be stopped, and it’s expected that the next release of the IDE will have a newer release of the AVR-GCC compiler, which will have the right values for this setting. 1 The reset resistor MUST be ~ 120ohm, not larger. #attiny85at8.build.f_cpu=8000000L 8 x times too slow! 1) 120 ohms is recommended. The 500 ohms that worked for me is not universal. 2) The ATTiny85 chip comes pre-programmed at 1MHz, not 8MHz. Instead of making the change you did, you should use attiny85at1 instead of attiny85at8. I referenced the 8MHz section by mistake in the article. I have corrected it to reflect the 1MHz default. You should probably make the changes to CHIP.upload.using=arduino:arduinoisp to every ATTiny chip & clock you intend to use, where CHIP is attiny85at8, attiny85at1, etc. Then, make sure you choose the right chip/clock for your application in the Tools/Board menu of the Arduino IDE. It’s a colaboration between the shop in the link and me. Oh man, this was gonna be my first board design project, but I guess I didn’t search hard enough to see someone else did it. Nice job! but will the following control structures work on it aswell? if you can reply asap, that would be great! Yes – you use the same compiler and the instruction set is the same. Not only can you write standard C, but C++ classes as well – just like the Arduino. You do need to watch memory more carefully though. Since there is no bootloader, you do have the entire memory space (an extra 2k). I am finding I can do a fair amount of stuff in 8K, but it is pretty limited to simpler programs. I would not even consider using a chip with less memory than that. thank you for your reply… im not to worried about memory… my projects are complex, but small! thanks for this awesome info and tutorial. I am a newbie to Arduino my question is … if I write up code in Arduino code (NOT C++ or C) will that work on the ATiny or will I have to write the code only in C++ for it to work ?? Because I am not good with c/c++ it would be very comfy if I could just use the default arduino code… And also like the previous person asked how do I find out which arduino command will work and which ones won’t ?? The default Arduino code is C++. The Arduino part is their library to make it easy to use. The same commands/functions work for both Arduino and ATtiny for the most part. The main difference is which pins are available. I am working on another article to give more details. Check back in a bit. as Scott has not come back yet, let me add. Yes it is completely possible. You can set up and test your program in the IDE/Arduino and then use your Arduino to burn that code on an attiny85. Just make sure you are only using those commands that the Attiny knows. 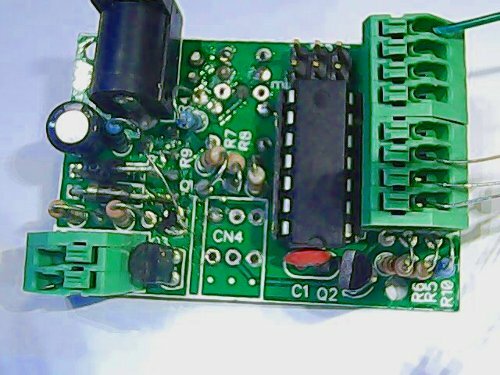 I allready used this succesfully for Attiny45 but can I use this methode for Attiny2313 as well ? The fact is that I need more inputs, my sketch is small enough for the 2313. Absolutely. You may need to check your SKETCHES/hardware/tiny/core/tiny/pins_arduino.c file for the proper pinouts. the best websites on the web. I most certainly will recommend this blog! Sorry just found the pins_arduino file, but which pins are analog inputs – only PB0 and PB1 ? Great job! I’m using ATtiny 45 for this tutorial. Thanks. I am new to this so I was wondering if I can use the ATtiny 13 with your code? well, I thought I had it working but now when try to upload a sketch I see one quick blink on the red led (error) then the green led flashes several times. The IDE reports that uploading is complete and displays no error messages but the attiny led does not blink. I wonder if I damaged the attiny at some point? Hard to say – lot’s of things can go wrong. Try again, turning on verbose output during upload. It sounds like it is uploading. Check your sketch and LED pin to make sure they are indeed the same. Also, try using a different pin. hey I want to know,if the micro-nucleus.hex file which is the bootloader needed for attiny 85 to be programmed by usb ,can I burn it using arduino as ISP ?? Yes. The Arduino when configured as an ISP and the ArduinoIDE selected to use it as such will burn any code desired to the ATTiny through the standard ICSP connector. Sounds like a fun project. Hi, this is just what i am looking for as i build models and want to incorporate Arduinio in getting all the lighting correct. I was going to use an Arduino board in the model! Which ATTiny85 can you sue, there seem to be so many different types. Is it any of the ATTiny 85 range? I see 20su and 20 PU etc when i do a search for ATTiny 85. Any help greatly appreciated. Hey… Thanks for the great tutorial. You can program ATtiny13/15/25/45/85 with these shield also. I found one here its very cheap and easy no jumpers and breadboard needed. Great tutorial. Can this technique be used with Attiny 10? http://www.htlinux.com/product/attiny-isp-shield Here is the ATTiny ISP Shield makes the job very much easier. and Arduino as isp THE SKETCH DOES NOT VERIFY, and fails to upload to the 85. This website is just gret. I’ve search these details a whole lot and I view it that is professional, easy to comprehend. where each learner or scholar can calculate ratings gpa levels.